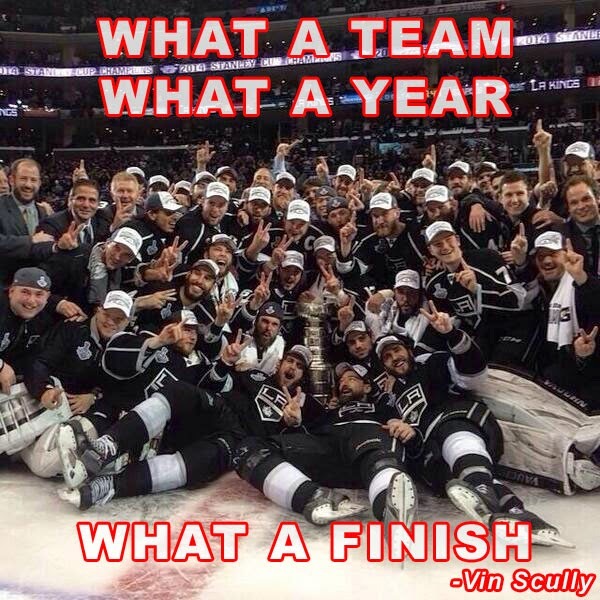 I thought I would borrow the lyrics of a famous song and mutilate it. 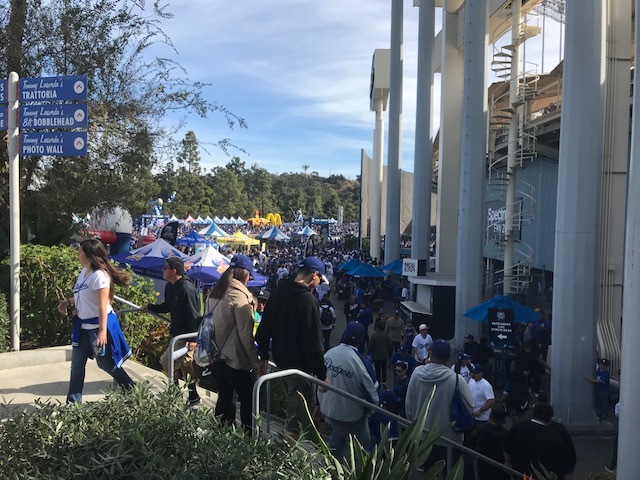 "Lines, Lines, Everywhere there's Lines"
It was packed that Saturday. More packed than a can of sardines in the the middle of a pallet of canned sardines. 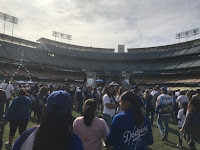 Moving around from the concourse to the field and back to the concourse was an almost impossible task. 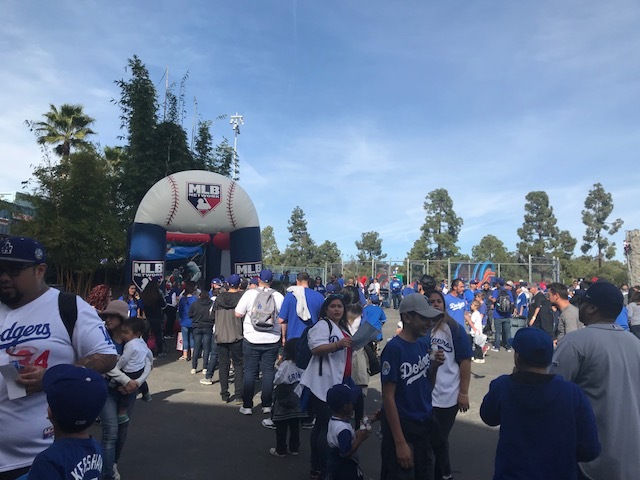 Everywhere you went you ran into a line for this or that. 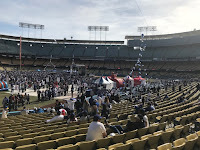 In fact, it was so crowded I've heard rumblings that this was the least enjoyable of all the FanFests held thus far. 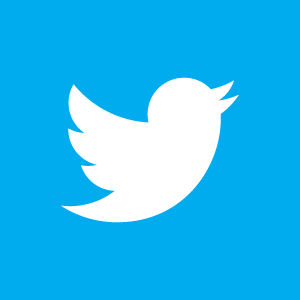 Nevertheless, I am certain that an majority thought differently. 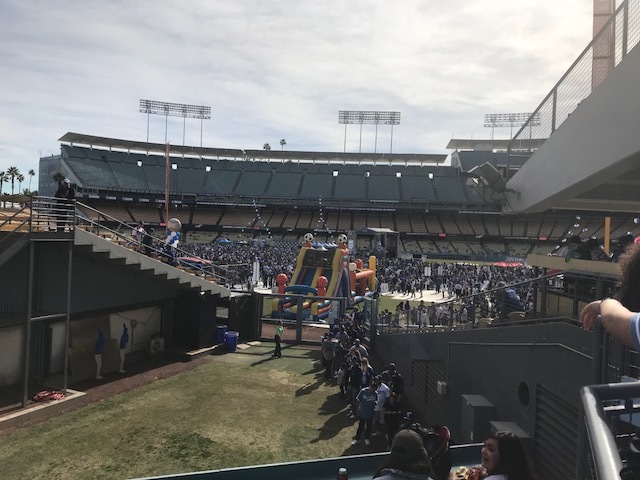 Most, it seemed, were just happy to be back at "Blue Heaven on Earth," and eager for the 2018 season to begin. 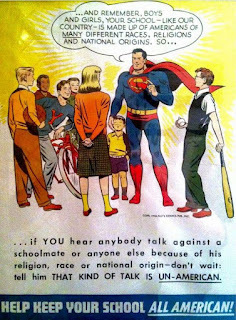 I know, I am. 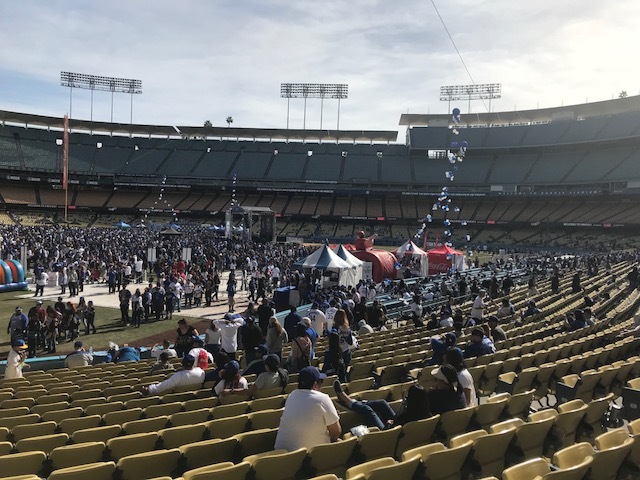 BTW, there were over 35,000 Dodgers fans at the stadium -- a new record. 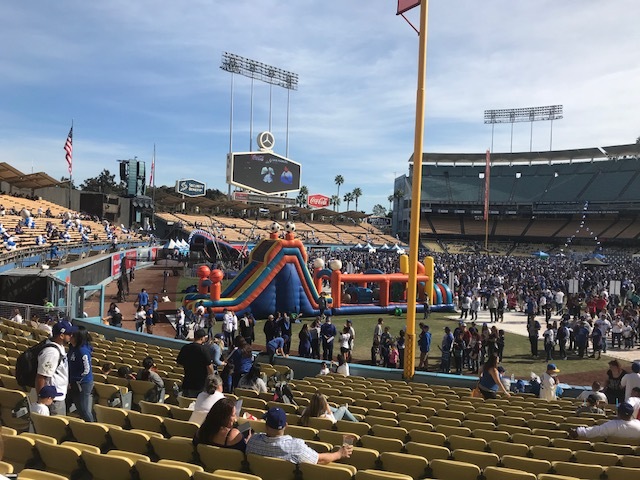 As for the event itself, it was set-up almost exactly as last year -- with the exception of the stage being relocated to behind second base. 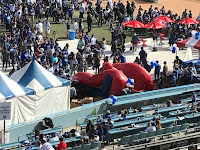 In prior years it had been placed along the right field line. Also, the area behind the pavilion seats (in the parking lot area) was expanded and enlarged. 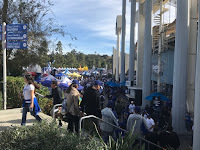 Per Rowan Kavner at Dodger Insider; "FanFest brings record crowd"
Per Cary Osborne at Dodger Insider; "Team of stability shows its face at FanFest." 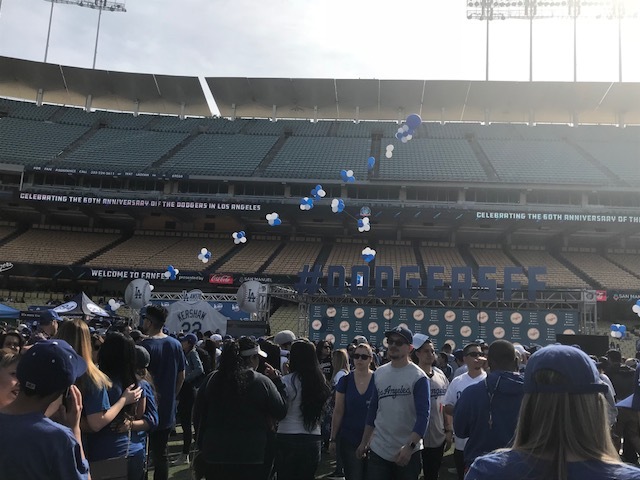 The LA Daily News shares a bunch of pics from FanFest here. 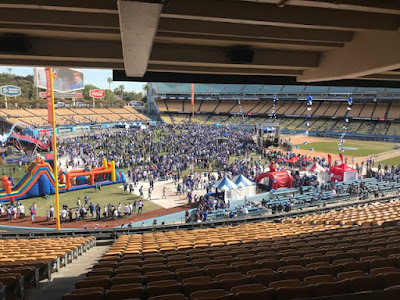 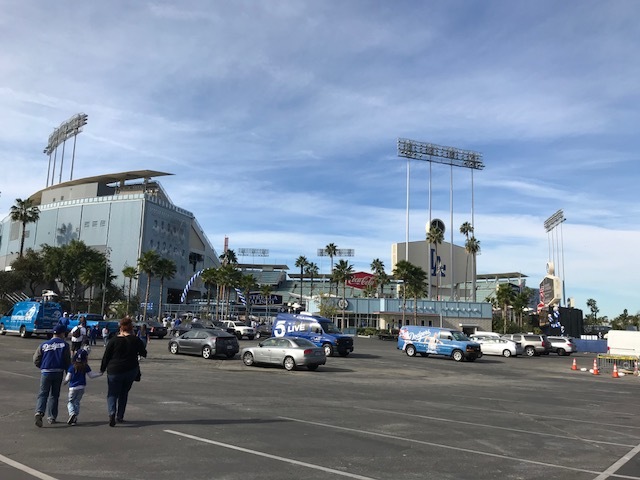 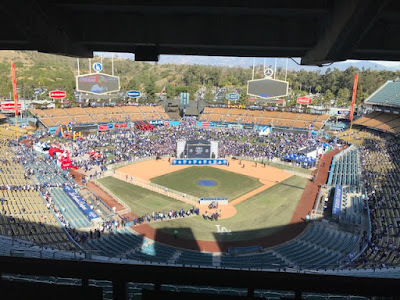 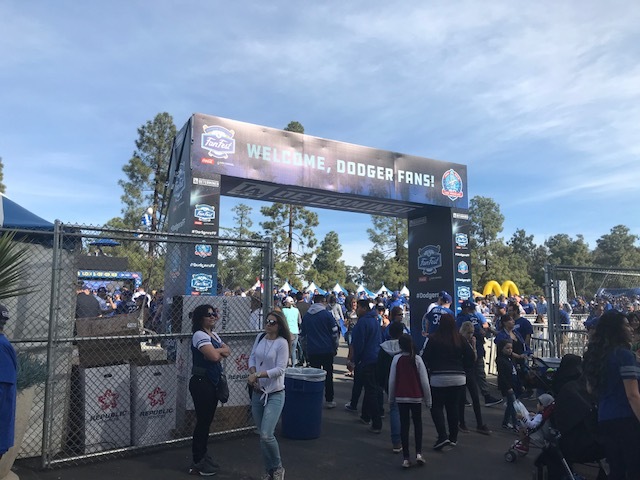 Per Jason Reed at LA Sports Hub; "A first-timer at Los Angeles Dodgers Fan Fest: My review." 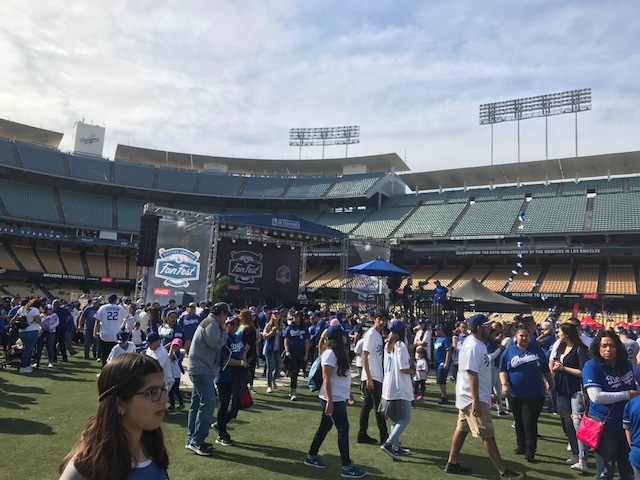 Per Ron Cervenka at Think Blue LA; "Dodgers FanFest draws record crowd." Via Michael Duarte at NBC Los Angeles; "Video: Player Interviews as Fans Set Record for 6th Annual Dodgers FanFest." 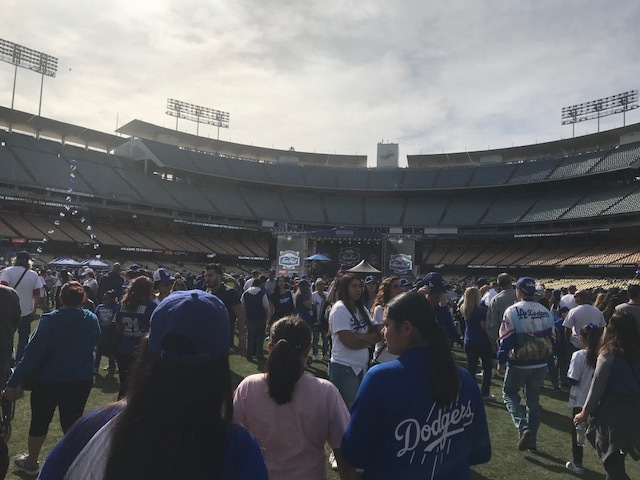 Per Cat Loves the Dodgers; "Fan Fest 2018" -- Cat shares a bunch of great pics from the day. 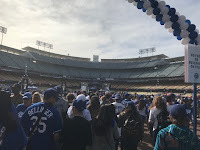 YouTube Video: Hall of Fame Baseball Cards shares their vlog from the 2018 Dodgers FanFest (video link). 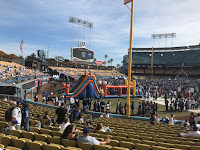 Here is Part 2 of their vlog (video link). 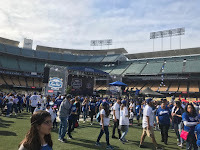 YouTube Video: Diaz&Co shares a video from the Clayton Kershaw "Meet & Greet" at the 2018 Dodgers FanFest (video link). 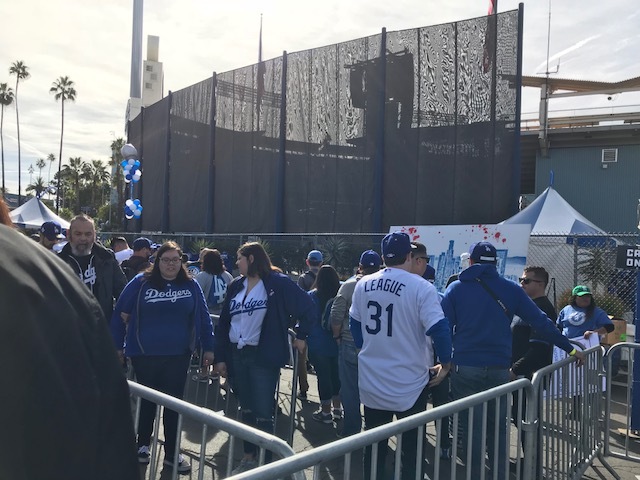 YouTube Video: All Axcess TV shares their video from the 2018 Dodgers FanFest (video link). 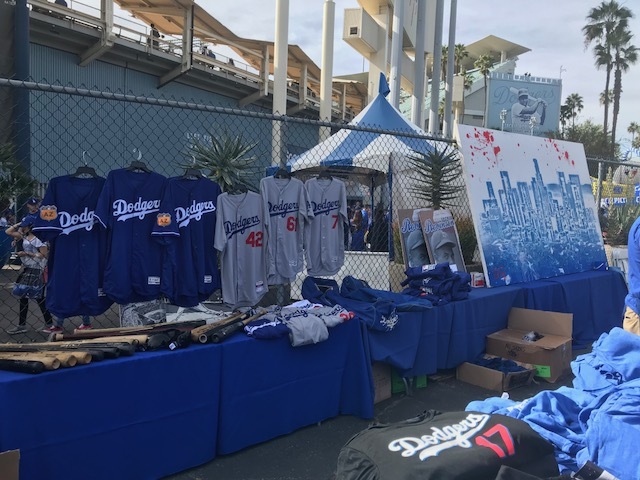 Here is Part 2 from the 2018 Dodgers FanFest (video link). Dodger Blue has a bunch of player interviews available: Julio Urias (YouTube Link here); Joc Pederson (YouTube Link here); (YouTube Link here); Chris Taylor (YouTube Video link) Justin Turner (YouTube Link here); and Dave Roberts (YouTube Link here). 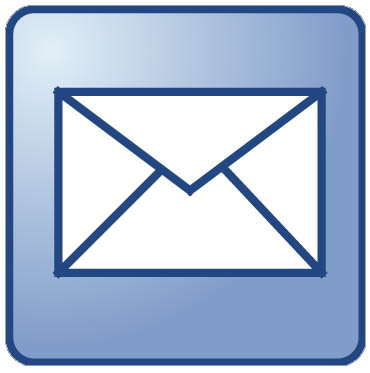 YouTube Video: Claudia Gestro at the LA PostExaminer covers the FanFest (video link). 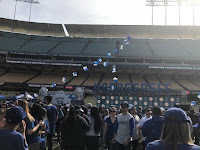 There are interviews of Ross Stripling, Farhan Zaidi, Julio Urias, Kenley Jansen, Joc Pederson, Justin Turner, Kenta Maeda and Chris Taylor. 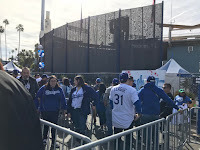 Above is an entrance into the rear area of FanFest. 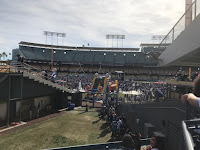 There were a whole bunch of kids activities, the garage sale and other stuff happening back there. 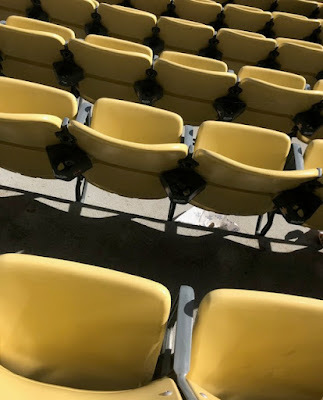 The below pics mostly look at what the inside of the stadium looked like. 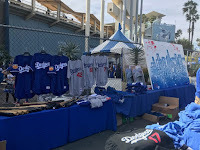 These next group of pics are from the Dodgers Foundation garage sale. 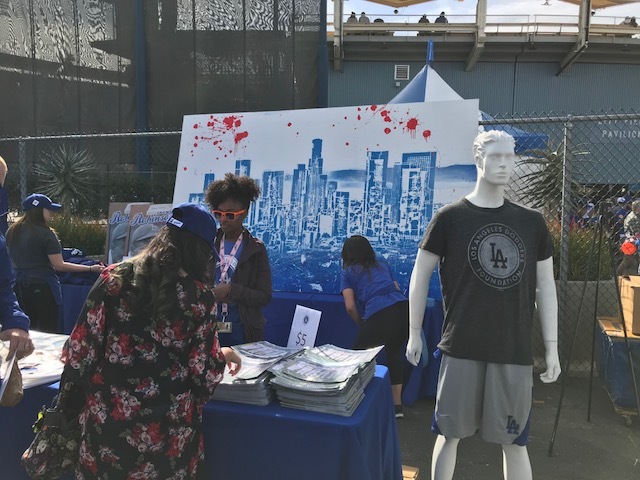 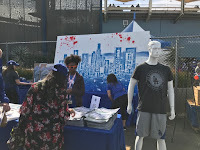 The large painting you see above and below was painted by Dodgers outfielder Joc Pederson, and was being sold through a raffle. 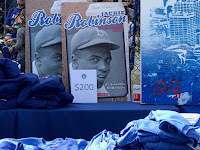 Also, left of that painting are advertising posters that had been signed by the daughter of Jackie, Sharon Robinson. I stood in line for a good hour, or so, and came away with two Dodger caps (at $20 a piece) and a Dodger CD filled with recordings of famed Dodger games. 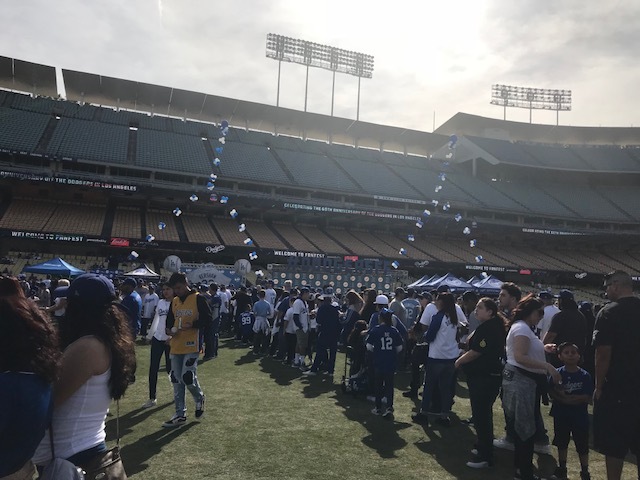 Can you tell us more about the CD with the famed dodger games? 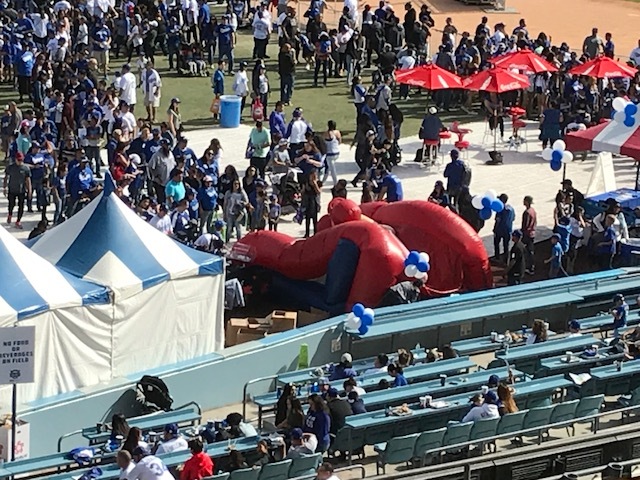 I never knew that existed. 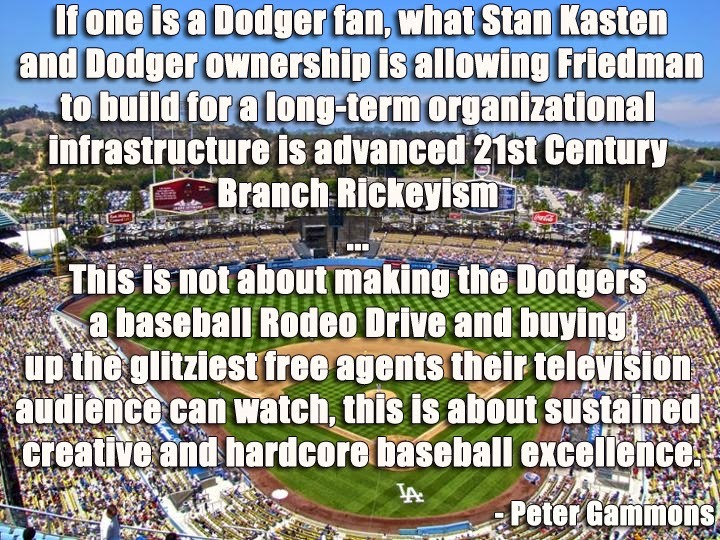 Yeah... 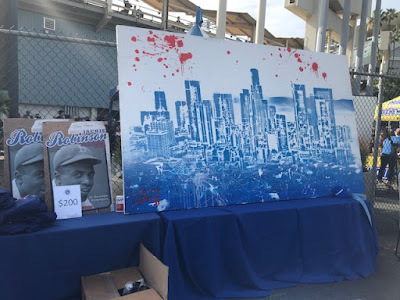 It is called "Dodger Stadium's Greatest Hits" and is narrated by Vin Scully. 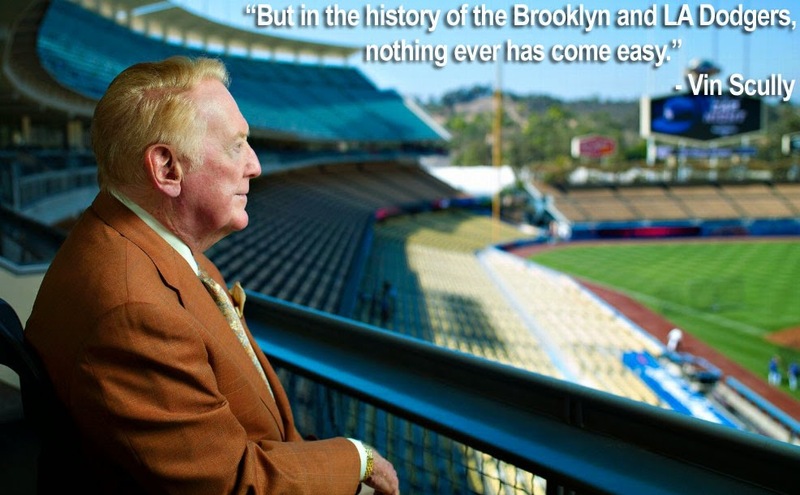 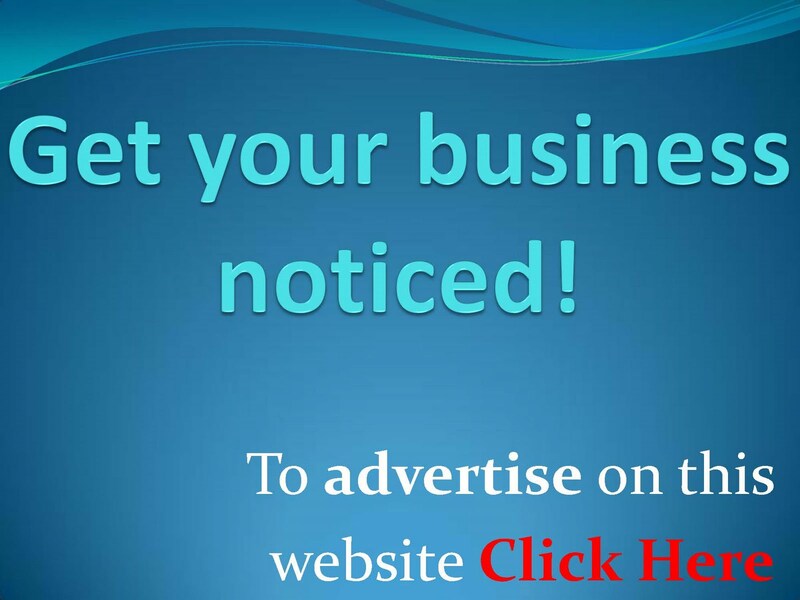 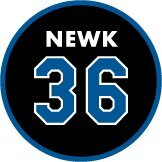 What he does is provide highlights from 4 decades - from the 60's to the 90's.